In The Apple Market Share Myth, I demonstrated how overall market share numbers can be used to suggest ideas that have no basis in reality. Here, I’ll look at the slippery aspect of numbers, prove that a quality share of the market can be better than a larger market share, and then compare how the definition of a market is critically important in determining how useful market share numbers are. In particular, I’ll look at the iPod’s market share. •Adobe reports that about half their profits come from Mac users. A common error in comparing market share numbers is forgetting that Apple sells both the hardware and software. 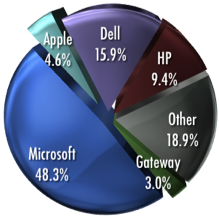 Comparing Apple's PC market share with the two market leaders, Dell and the merged HP/Compaq, ignores the fact that while Dell and HP each sold ten times as many PCs as Apple, they had to pay Microsoft for an operating system on every sale. FUD flingers often wallow in market share numbers to highlight the suggestion that Apple's 2.2% compares to a 97.8% share by Microsoft in operating system market share. That conveys the opposite false impression, because Microsoft makes no money at all from PC hardware profits. Looking at the PC market as a combination of two different products, software and hardware, only gives Apple half the credit for their sales. Apple is the only market player able to make money from both sides of the coin. Apart from Apple, everyone else in the industry only makes half of what is sold as a whole PC. Users who buy a non-Apple PC get a CPU and a Windows license; they realize they’ve made two purchases, so why doesn’t the Gartner Group, IDC, and others publishing PC market share? By counting PC sales as a hybrid of two products, hardware and software, Apple’s share of the overall market would stay unchanged, while Dell, HP, and Microsoft’s reported shares would all be cut in half! Apple’s fourth place, 4.6% share of the US PC market, as reported by Gartner in their Q2 2006 report, compares favorably with other PC makers. Once you stop double counting PC hardware and software sales however, it reflects Apple’s significant position in the industry even better. Those numbers echo the reality one can observe everyday: why CompUSA assigns significant space to Apple’s products, why CDW and other mail order catalogs and online retailers have a dedicated Mac sections, why Apple’s retail stores work, and why Apple has its own topic category on sites like Slashdot and Digg. The revenues Apple earns in hardware sales is reinvested in the development of Mac OS X, which has outpaced the development of Windows XP and its eventual successor. 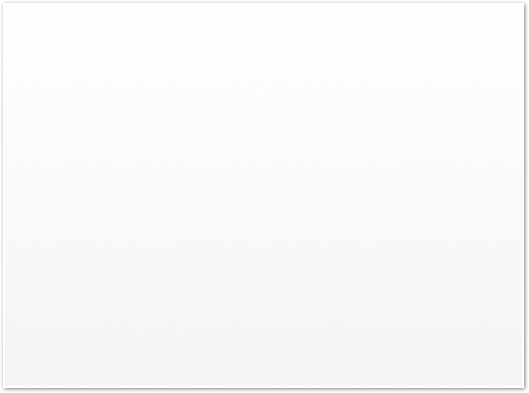 Apple can consistently improve upon the tight integration between their hardware and software, creating a higher quality, differentiated product that neither Microsoft nor their hardware partners can deliver on their own. 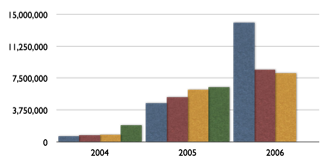 Also missing in the reports of market share percentages is the value of a given share of the overall PC market. This impacts profits; higher end systems have higher profits, while the cheapest systems are often loss leaders. Apple doesn't have a low end product filling out their share of the market through low profit, high volume sales. They can't, because a super low end Mac would erode their overall profitability by cannibalizing higher end Mac sales. In the Windows arena, market leaders like Dell and HP can't afford not to sell a huge number of low end loss leaders; if they didn't have $300 PCs for sale, they'd lose volume sales to other bargain bin retailers. Dell is working to avoid selling low end PCs because there is little profit in that segment of the market. There is little Dell can do to differentiate themselves from other PC makers however. Their large share of the market is at risk, and actually falling due to pricing pressure, particularly from HP. More importantly, market share quality impacts the significance of a vendor's users. Macs are over-represented by creative users and by tech enthusiasts and influencers in emerging markets. This was true in the emergence of the commercial Internet, and today applies in areas such as podcasting, open source, and UNIX compatible development. This serves to keep the Mac platform well represented in the market for software availability, far more so than a 3% market share would suggest. The only area where Macs are not significantly over represented is in PC gaming, a market which Microsoft has worked hard to tie to their proprietary technologies. Clearly, the Mac's low worldwide market share is not directly proportional to worldwide users' mind share, consumer interest, or in development activity. Consumers buying a Mac historically had to go out of their way to do so. Until recently, they had to pay a premium for Apple hardware, deal with retailers trying to talk them into a more profitable PC sale, and forgo the ability to run PC applications at comparable performance. Those three issues have since evaporated. Now that Apple is effectively building PCs, their overall market share compared to Dell, HP and others is actually a more significant figure than ever before. Contrasting sales of Macs and other PCs is no longer an apple to oranges comparison. For the first time, Apple will be competing directly against other PC makers. Apple's new Intel Macs erode the previous barrier to competition. Users will be able to factor Apple's hardware against units from other PC makers without worrying about Windows compatibility. The only remaining compatibility factor will be: which PCs can run legally Mac OS X? Apple is finally in a position to compete as a PC maker, rather than just against PC makers. How well Apple does going forward has a lot to do with how innovative they continue to be in developing their hardware and software. The company lost their lead in the early 90's by contentedly raking in profits when they should have been finding ways to remain innovative and relevant. Additionally, without any compatibility constraint in place, Microsoft will finally face real competition from Apple, rather than being insulated from competition simply by being the default installation and included in the price of PC hardware. Microsoft has never been able to compete against an installed operating system, so it should be interesting to see how this works out. As a side note, Microsoft’s Unix distribution, XENIX, was the last stab Microsoft took at competing in the free market. After focusing on NT, they spun XENIX off to SCO for a 25% ownership in the company. SCO has since been famously used to attack Linux in a massive FUD campaign to discredit Linux development and question its legal legitimacy. While Apple's share of the PC market is looking to swing upward, there have been a flurry of giddy blog entries excited about Apple loss in market share in the music player segment. Reportedly, Apple's overall share of the market for devices able to play music fell to 75%. This highlights another problem in throwing around market share numbers without any context. These numbers don't compare devices able to play music against devices people actually use to listen to music. The significant downturn in iPod market share doesn't reflect competition from new music players, but simply figures in large numbers of devices, mainly mobile phones, which can now play MP3s. Some people actually do use mobile phones to listen to music, but it's pretty clear those numbers are being used to draw conclusions that aren't true. In market share comparisons pitting PCs against Macs, there is limited overlap among users; consumers and businesses tend to exclusively choose to use Macs or PCs. Few people can afford to have both sitting on their desk unless they have special circumstances that require it. However, many people commonly carry a mobile phone and an separate music player. I considered the limited overlap between the two in Why Mobile Phones Make Bad iPods. Further, nearly everyone with an iPod also has a mobile phone; clearly, all those iPod users choose not to use to use their phone to listen to music! Pitting mobile phones against the iPod in a market share percentage war is therefore rather pointless, unless it can be proven that sales of iPods are dropping dramatically. The sales figures in the above chart show that isn’t the case. 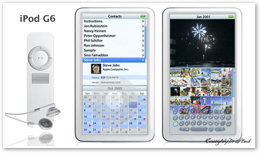 Sales of the iPod surged to over 14 million units, more than 200%, in the first quarter of 2006, reflecting its huge popularity in the holiday gift giving season. 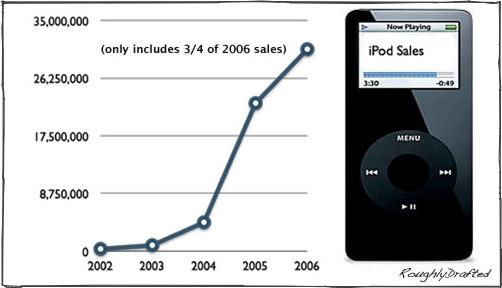 In the two quarters since, the iPod's popularity has still increased by 32% over last year's sales. Those numbers reflect a satiated demand for the current iPods following the huge surge, not a sudden trend toward using mobile phones and PDAs to listen to music. If Apple's sixth generation iPod, likely to be released sometime this quarter, does not spur new demand, then we can start to assume people have suddenly figured out how to get their Treo and PDAs to sync music, or have decided it is far cooler to belt a Motorola Q to their arm than an iPod nano. Until then, this can safely be regarded as yet another attempt to create headlines or spew FUD. I have yet to see anyone listening to music on a mobile phone outside of a Verizon commercial. In fact, the 30 million iPods sold so far this year and the 22 million sold last year are the best proof that users are choosing not to use their mobile phones to listen to music, but rather paying a significant premium to get a dedicated music player! The next time you hear market share numbers being thrown around, consider the context. Numbers don't speak for themselves, they require critical interpretation.